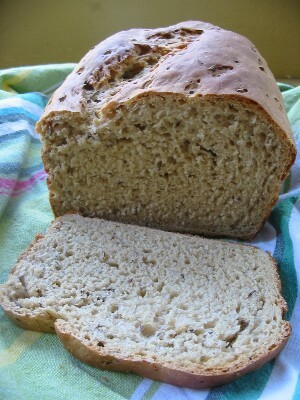 A soft salt free bread studded with caraway seeds and wrapped in a slightly crisp crust. This isn’t chewy like a standard Jewish rye, but its light texture and remarkably pleasant taste make it a lovely choice for breakfast toast, as a base for grilled Swiss cheese sandwiches, and more. Yields one loaf (serves 12). Measure the yeast into a mixing bowl. Add the warm (lukewarm, NOT hot) water and let rest 3 minutes. Stir in the molasses and honey, then the seeds and oil. Stir in the rye flour, then gradually add in the all-purpose flour, one half cup at a time. Once dough begins to form, turn the bowl out onto a lightly-floured surface. Gather up the dough and begin to knead. Knead for 5-6 minutes, until dough is smooth and elastic. Lightly grease a clean mixing bowl, place dough inside, and cover well (I like to use a piece of clear plastic wrap secured at the top with a rubber band). Set in a warm place to rise until dough has doubled in size, about 1 hour. Once dough has risen, remove cover and punch down. Turn bowl out onto a lightly floured surface and knead for a minute. Form dough into a loaf shape and place in a greased loaf pan. Cover loosely with some lightly greased plastic wrap, and allow to rise until doubled in size, 1 hour or less. Once loaf has risen, preheat oven to 375 degrees. Place pan on middle rack in oven and bake 35 minutes. Remove from oven. Carefully remove bread from pan and place loaf on wire rack to cool. Allow bread to cool before slicing. Hey Nik – good luck with your trial. Not sure how well it will work in this recipe, but it definitely is worth trying, and tweaking. Best wishes to you! Is the 1T instant dry yeast 1 teaspoon or 1 tablespoon please? Thank you! It’s 1 tablespoon yeast. I use the big T. for tablespoon and the little t. for teaspoon. This recipe sounds wonderful. Can it be used in a bread machine?